If you can believe it, Opening Day is only five weeks away, and we're previewing each division every Wednesday. Baseball is an individual sport masquerading as a team sport, so, thus, we'll be previewing each division by counting down the 20 most pivotal players in the division. These aren't necessarily the best players. They're just the ones whose 2018 performance will be most vital to their teams' success this season, and in seasons moving forward. To keep it fair, we can only pick four players from each team. Today: The American League East. Tell me what you think -- not just about what you think of this list, but also whom I should not miss when I do the National League West next week -- at will.leitch@mlb.com. Arroyo is an extremely promising third-base prospect who already has 135 at-bats in the Majors and is ranked No. 81 on MLB Pipeline's Top 100 Prospects. I hope Arroyo can remember all those things when Rays fans look over at third base and, for the first time in a decade, see someone other than Evan Longoria there. Not just that, but Longoria is saying that he "feels bad for the Rays' fanbase." So, you know, good luck, kid. He's not going to be back for a few months, but by the time he gets back, the Orioles will have a pretty solid idea of whether they're coming or going. Either they're going to need Britton to come back and work himself back into Britton-shape because they're fighting for an American League Wild Card spot, or they'll need him to come back because they're selling hard at the non-waiver Trade Deadline. You can tell pretty well what kind of baseball fan you're talking to when you discuss Kiermaier. Your FanGraphs obsessive thinks he's one of the best, and certainly one of the most underrated, players in the game. Your usual baseball-card-stat fan is totally baffled at what all the fuss is about. Did the Blue Jays just get themselves a cost-controlled power bat, one who can play center field, on the cheap? After trading for Marcell Ozuna, the Cardinals didn't have a place for Grichuk, so they sent him to Toronto for reliever Dominic Leone, and Grichuk might be exactly the right fielder the Blue Jays were searching for. He strikes out way too much, and he's probably never going to be a consistent on-base threat, but he's under club control through 2020, plays the outfield like a dream, and if you make a mistake pitch to him, he will pulverize it. The Orioles are making a last-ditch, all-in mad dash in the AL East this year, and while some might question the wisdom of such a maneuver, heck, the world was never made worse by people doing everything they can to win. (Note: The world is in fact always made worse this way.) If the O's are going to hang in, they're going to need all the offensive firepower they can muster, so it might be handy if the guy they still owe $127 million to could start launching bombs again. You can forgive Rays fans for growing a bit exhausted with the "when our stud prospects get here, it's gonna be a different story, you'll see!" game, but the waiting game for Adames, the No. 22 prospect in the game according to MLB Pipeline, may still be worth it. Not only does Adames have all the tools, he's one of those makeup machines, the instant team leader everyone is always looking for, particularly out of the shortstop position. Gausman is the next in a long line of talented Orioles starters to never quite put it together in Baltimore, and there is always the fear he will leave town and immediately turn into Jake Arrieta. Gausman was healthy all of last season, which means he's ostensibly Baltimore's ace, but his skills have never quite translated into top-tier success. Which means the rest of baseball is ready to buy low. When the Red Sox signed Porcello to a four-year contract extension before the 2015 season, they didn't think they were getting an AL Cy Young Award winner, any more than they thought they were signing a bust. The first two years of the deal, they've gotten both. Porcello led the Majors in wins in 2016, and losses in '17; that's pretty difficult to do. Somewhere in the middle would be just fine for Boston, particularly now that he's just a fourth starter. For all the talk of Stroman's unpleasant arbitration experience, there isn't much evidence that contentious arbitrations cause any sort of damage, short or long term. Good thing, because despite whatever they said in that room to Stroman, the Blue Jays desperately need Stroman to keep pitching like the ace he nearly was in 2017. It's almost impossible to see a way for the Blue Jays to contend without Stroman at least duplicating his '17 season. It's funny to think that the young Yankees player everyone was excited about heading into 2017 wasn't Judge: It was Bird. After his horrendous start, he came on late, and the Yanks felt comfortable enough with him that they avoided any first-base free agent temptations. If Bird is fully locked and loaded, this lineup is even more terrifying that it already is. And if not: The Yankees will not lack for options. Halftime break! AL East mascots, ranked! Discovered by fishermen who noticed he was drawn to the boat by the smell of hot dogs, Raymond Ray looks a little like a character in "The Life Aquatic with Steve Zissou." Blue Jays are actually quite aggressive birds, but Ace is pretty chill, all told. He does get points for being an improvement on the old BJ Birdy, who looked insane and had a redundant name. All mascots are for kids, but I might humbly submit that Wally is maybe a little too scary for kids. The Yankees famously do not have a mascot, though in a pinch, Justice Sonia Sotomayor would make a pretty great one. Tanaka's peripheral numbers suggest that if he's not an ace, he's No. 2-starter material at least. He has a terrific K/BB ratio (the best on the team), and his season ERA was inflated by a dreadful May (8.42 ERA). Tanaka at his worst is still a rotation mainstay, and he is the one guy in the rotation who should be better but, in 2017, just wasn't. In the 2013 World Series, when most of us were first seeing Bogaerts, it appeared we were looking at the next great superstar. It hasn't worked out that way, with Bogaerts never becoming that superstar -- and even taking a big step back in 2017, dropping to only 10 homers and losing 21 points in batting average. He's still only 25 years old, though, and the talent is still all there. If this is Bogaerts' breakout season, the Red Sox's lineup could be scarier than you think. What was up with Osuna last year? He struck out 11.7 batters per nine innings. Osuna dropped his walk rate for the third straight year. He gave up only three homers in 64 innings pitched. Osuna had a 0.859 WHIP. Those numbers look totally dominant, right? So how in the world did Osuna blow 10 saves? If the results match the skills, the Blue Jays will have the ninth inning on lockdown. Essentially the last man standing at this point, right? Now that the Rays' rebuild seems imminent, there's not much reason to keep Archer around, particularly when there isn't a team in baseball (save for Tampa Bay, apparently!) who couldn't use a cost-controlled ace who's also charismatic and fun. If the Rays want to fully restock their farm system, Archer and closer Alex Colome are surely the next (and maybe last) to go. One of the many enticing aspects of trading for Machado in the offseason -- as many, many teams tried to do -- was the sense that he's going to erupt in this, his contract year. Machado had an unfortunate 2017, but he still had his moments, and he clearly has talent to burn everywhere. He'll be at shortstop this year and eager to impress potential free-agent suitors. How long Machado is in Baltimore may depend on how long the Orioles can hang around the race; the minute those leaks trickle out about "the O's are listening to offers on Machado," this is instantly the biggest story in the sport. All right, so now that he's finally here, now what? The long, slow, pained offseason seduction between the Red Sox and Martinez finally consummated this week, at a reasonable price for Boston and, of course, a fortune for Martinez. But there is an extended, sordid history of expensive free agents coming into Fenway Park and being eaten alive almost immediately; remember, the Red Sox will still be paying Pablo Sandoval $18.5 million next season. Martinez is no Sandoval, but Red Sox fans have a way of eyeing a new guy warily for a while when he shows up in town. The upside is obviously huge, but remember: They were mocking poor Jack Clark in The Town 20 years after he signed. Speaking of big, expensive Red Sox free agents whom the town quickly turned on. Price is only two years into his $217 million deal, and he spent most of his 2017 either in the bullpen, hurt, feuding with Dennis Eckersley or being hissed at by Beantown faithful. Just five years to go! Price apparently isn't too sore about his time in Boston so far; he was one of the main ambassadors selling Martinez on the place. But he has an opt-out clause after this season if he wants to use it, but that would require exactly the sort of year the Red Sox were paying him for in the first place. What are the Blue Jays going to do with Donaldson? Merely the whole next decade of the franchise might rely on the answer. It is a big story that one of these massive humans exist. It's a bigger story that they both exist. It's an even bigger story that they're on the same team. Now add to the mix that their team is the Yankees -- a club that seemed to have lost its swagger but now has it back a thousandfold. In retrospect, it seems inevitable that these two wooly mammoths are in the same lineup, in the Bronx, secured now to spend their most formidable years together. They're the primary reasons to hate the Yanks again, which, of course, means the Yankees are, once again and at last, completely unmissable. They're the biggest story in baseball this year, and one of the biggest stories in sports. Who doesn't want to see what happens here? I cannot wait. We finish this preview, as we will with all of them, with predictions. I apologize in advance because these predictions are guaranteed to be correct and thus I'm a little worried I'm spoiling the season for you. TAMPA — Brandon Drury’s numbers don’t jump off the page in a way that would tell you he’s The Next Big Thing, yet the Yankees have been trying to pry him away from the Diamondbacks for years, convinced he has star potential. And given Brian Cashman’s track record in trades over the last few years, who would dare argue? For that matter, who knows, maybe Drury is another Didi Gregorius-like steal in the making. “Ah geez, I knew that was coming,” Tim Naehring said with a laugh on Wednesday. Well, why not? Naehring, now Brian Cashman’s top lieutenant, was one of the scouts who pushed hardest for the Gregorius trade with the D-backs four years ago, and now he, as well as many of those same scouts, are projecting similar possibilities with Drury. Drury, who turns 26 in August, has had a couple of solid seasons in Arizona, hitting .267 with 37 doubles and 13 home runs last year. But he doesn’t walk much, which led to a .317 on-base percentage, and his home numbers in the desert are dramatically better than his road numbers. So why do the Yankees love him so much? For starters, they think being bounced around from third base, his natural position, to left field and second base, to make way for Jake Lamb, has affected his offense at least to some degree, and their plan is to put him at third and leave him there. They also see what Naehring called “a swing that profiles well at our ballpark,” meaning that he drives the ball to the opposite field naturally, which, as a righthanded hitter will lead to a lot of home runs at Yankee Stadium. Which, of course, is another way of saying the Yankees think they can get him to stop chasing so much, especially against breaking stuff, and improve last season’s 3.68 strikeout-to-walk ratio. No less significant, the Yankees are convinced Drury’s athleticism and mental makeup give him the type of foundation that will allow him to make the changes they project. Some of that comes not just from their scouting projectables but input from their new third base coach, Phil Nevin, who managed Drury in the minors with the Diamondbacks a few years ago. “I know his work ethic,” Nevin said Wednesday, “and the important thing is I know he wants to be great. He loves the game. He’s a gym rat and a very intense guy. People will see that very quickly. All in all, the Yankees aren’t saying Drury is Mike Schmidt, but you get the feeling they’re convinced he can play at an All-Star level. Clearly they weren’t this high on him when he was a 13th-round draft pick out of high school by the Diamondbacks in Oregon, but their scouts were struck by his potential in the minors as far back as four or five years ago. Obviously there was a limit to how much Cashman would give up for Drury. Same this winter when he said he had “many extended conversations” with current D-backs GM Mike Hazen. And it wasn’t until Hazen engaged the Rays in a three-way deal that it came together, in part because Tampa Bay felt strongly about Yankees second base prospect Nick Solak. The Yankees also gave up minor-league pitcher Taylor Widener, so the deal was further testament to the depth of their minor-league system, as neither player is considered among their top 10 prospects. In any case, the Yankees finally have their man, and at the right price, too. Drury, in his pre-arbitration stage, will earn about $600,000 this season, assuring Cashman of having payroll room under the luxury-tax threshold to pursue pitching, if necessary, at the July trade deadline. So will Drury live up to all of this potential the Yankees see in him? Well, Cashman has been on a roll lately, when you consider the trades he has made in recent years for Gregorius, Aaron Hicks and Starlin Castro, as well as the deadline deals last year for Sonny Gray, David Robertson, Todd Frazier and Tommy Kahnle, and the prospect haul he brought back in 2016 for Aroldis Chapman and Andrew Miller. Is Drury the latest notch on the GM’s belt? Would you bet against it? February 22nd: So it turns out the MLB.tv schedule has a new landing page. The old page doesn’t work anymore. Anyway, I found the new page and have updated the schedule with the MLB.tv broadcasts. Twenty-one of the Yankees’ 32 exhibition games will be broadcast live this spring. 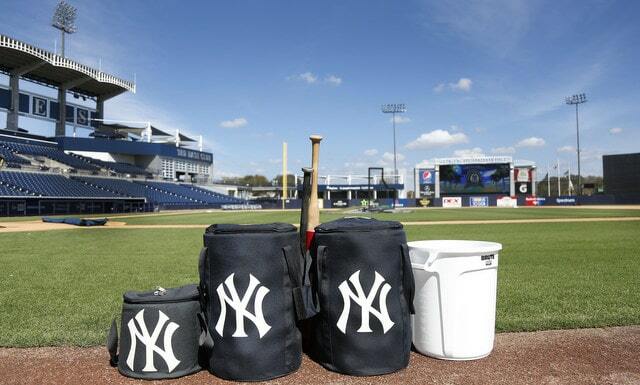 February 19th: This Friday the Yankees begin their 31-game Grapefruit League season at George M. Steinbrenner Field in Tampa. They’ll close out the spring schedule with an exhibition game against the Braves at SunTrust Park five weeks from today. Opening Day is Thursday, March 29th, in Toronto. So close, yet so far. In recent weeks YES, ESPN, and MLB Network have released their Spring Training broadcast schedules, and at the moment, 18 of the Yankees’ 32 spring games will be televised live. That number will increase once the MLB.tv spring broadcast schedule is announced. Every network has scaled back on their spring coverage in recent years, but still, most Yankees games will be broadcast this spring. My gift to you is the table below, which has the team’s Spring Training broadcast information in one convenient place. You’ll be able to find this post linked in the Opening Day Countdown widget in the sidebar at all times. All start times are ET. TAMPA -- Part of the reason the Yankees acquired Brandon Drury from the Diamondbacks on Thursday was because he'd established himself as a solid major-league second baseman. The other reason? They feel the 25-year-old has got a ton of untapped potential, particularly at the plate. On Thursday, during his first comments at Yankees spring training, Drury said he also believes he hasn't scratched his offensive ceiling yet and explained a change he made in his swing designed to help him put more balls over the fence. "I don't feel like I've done anything like I'm capable of the last couple of years," Drury said, standing in front of his locker, which will be next to Russell Wilson's when the Seahawks quarterback arrives Monday. "Both (seasons) have been kind of a grind. The numbers are OK, I would say. But I don't think those past two seasons are half of the player I am. I truly don't believe it. But I've got to go out and do it." Last season, Drury hit .267 with 13 homers and 63 RBI in 135 games. He also had a team-leading 37 doubles. In 2016, his rookie year, he hit .282 with 16 bombs and 53 RBI in 134 games. Drury broke down his swing change and said he "got a lot stronger" in the offseason. "It's a simple move I'm making that's getting the ball in the air more," Drury said. "Actually, my (swing) path is more level up through it than down." Drury was playing out of position, having come up as a third baseman but moving to second in deference to All-Star slugger Jake Lamb. Now, the Yankees will have him back at third base, where he's expected to be ahead in the race for the Opening Day job, over highly regarded third base prospect Miguel Andujar. "I'm much more happy to be at third," he said. "It's more natural for me. Second base was tough to pick up but it was all right. I'm really excited about this." On Wednesday, general manager Brian Cashman said there was "more gas in that tank," referring to Drury's ongoing development. "We know our pro scouts really are high on potential, willing to dream on it a little bit," Cashman said. He added, "He's got a lot of ability at a lot of levels. I don't want to go through specifics but I think that this guy has a chance to be more than just a quality everyday player. But potential means you haven't made it yet. He's established himself as a quality major-leaguer but I know that he has dreams to be even more and our pro scouting department has the same visions. We're playing on those dreams right now." I hope they work at getting him on base more. Think back for a moment to the Yankees infield situation at the start of December. Veteran infielders held down specified spots, with Chase Headley over at third and Starlin Castro at second. Castro was willingly given up to bring in Giancarlo Stanton, and was traded with the certainty that at least one of the promising prospects the Yankees held would be able to win the job in spring training. 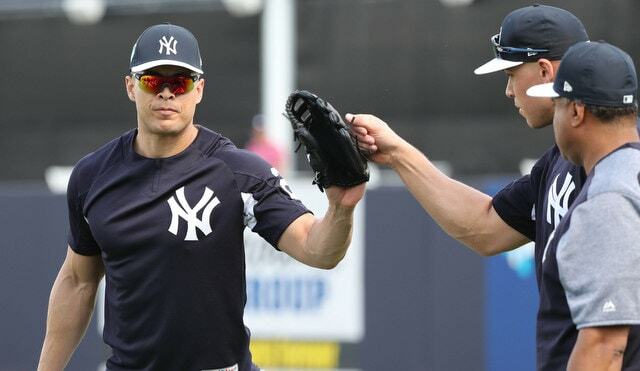 In time, minor league contracts were given to long-shot candidates Danny Espinosa and Jace Peterson in case the Yankees wanted to hold back Gleyber Torres for a short period of time to gain another year of control. Although those were prudent moves, neither player is worth having on the major league roster beyond that, so they don’t provide much depth. Then another trade was made, this time to ship out Chase Headley. While trading Castro brought a clearly superior major league talent back to the team, the Headley trade was the polar opposite. Headley’s contract, a one-year, $13 million pact, was shipped out alongside Bryan Mitchell to incentivize the Padres to accept. At the time, shedding salary made sense. Even though the Yankees were still under the luxury tax despite adding Stanton’s mammoth contract, there were a hoard of pitchers available on the free agent market that the Yankees were interested in, and an upgrade to the rotation seemed prudent. It did, however, create the scenario where the Yankees would have to rely on two rookies in their infield, albeit highly touted ones. For a championship-caliber team, there’s a lot of risk in planning to go that route. At the moment, that upgrade to the rotation hasn’t happened. Instead, the Yankees have sat on the cash they freed up, and entered spring training without a real benefit gained from trading Headley. Enter Brandon Drury. Cashman swung the three-team trade with the Diamondbacks and Raysto sew back up the hole he created a few months ago, acquiring a major league caliber infielder to provide quality insurance in case the rookies aren’t productive out the gate. Drury will almost assuredly be manning one of the two open jobs on Opening Day. If his performance is adequate then he can hold down the utility role over Ronald Torreyes. The only irony in having Drury be the final piece to this year’s infield is that offensively, Drury seems quite similar to the man the Yankees already had, Headley. Last season in 445 at-bats, Drury posted a .267/.317/.764 slash line with 13 home runs and 63 runs batted in. Meanwhile, in 512 at-bats Headley slashed .273/.352/.758 with 12 homers and 61 RBI. That’s not to say that Drury alone isn’t an upgrade over Headley. Drury is eight years younger and at least has a chance of improving, while Headley would have a good year if he matched his production from last season. Drury is also under team control for four years compared to Headley’s one-year deal. He can also better transition to the utility role than Headley. It did, however, cost prospects to acquire Drury. And regardless of your opinion on just how good those prospects were, that’s still value lost. Value that won’t be returned until the Yankees make their move to utilize the cash freed up in trading Headley, until the chain of moves is finally completed. That possibly won’t happen until the trade deadline, so it’s too early to judge whether these series of moves were worthwhile. Here's a collection of Yankees things you need to know as they prepare for their first game of spring training. Topics include Giancarlo Stanton, Gary Sanchez, Miguel Andujar and more. With Aaron Judge sitting out Friday’s spring opener, expect Giancarlo Stanton to get the biggest cheers at George M. Steinbrenner Field when he steps up to the plate. By now, you know the whole deal: The Yankees seemingly came out of nowhere to add Stanton, the 2017 National League MVP, in December, and baseball fans have been calculating how many combined homers Judge and Stanton will hit. I believe Vegas had the over/under at 87.5. Spring training games don’t matter. Except Friday’s will absolutely mean something to the Yankees. While the final score won’t make anybody lose sleep, Aaron Boone will remember it forever as his first ever game as manager, and the Yankees’ first game with somebody not named Joe Girardi at the helm in a decade. If you’re keeping score at home, Matt Daley was named the Yankees’ assistant pro scouting director. He took over for Dan Giese, who took over the lead pro scouting director title from Kevin Reese. Reese took over the top player development position after Gary Denbo left to take the same role with the Marlins, whom his friend Derek Jeter owns. Daley, a righty reliever, pitched in New York in 2013 and 2014, appearing in 20 games. He played parts of five years in the bigs. On Thursday, Seattle Seahawks quarterback — and new Yankees minor-leaguer — Russell Wilson posted a video on social media saying that he’d arrive at Yankees camp Monday. He called out Aaron Judge and Giancarlo Stanton for a home run derby. He smiled a lot. Tampa is going to turn into a circus with him in town for a few days. By the way, the Yankees say Wilson won’t get into an spring training games. Judge isn’t playing because it’s part of the plan to give him about a week’s reprieve from spring training games. Sanchez isn’t playing, Boone said, because it’s part of a plan the team mapped out to keep him fresh. Gardner isn’t playing … well, weren’t told why, but it just makes sense that maybe they’re letting him rest. Missing the game won’t affect him in any way. Remember when backup catcher Austin Romine fought Miguel Cabrera in Detroit last year? Then remember when Sanchez sucker punched a couple players? Boone said the incident has nothing to do with why Sanchez isn’t playing against them Friday, and I think I believe it. Hard to imagine that carrying into this season and spilling on to the field. Too much money at stake to get suspended for old news. Thought this was interesting. Maybe players do it all the time. Maybe they don’t. But on one of the back fields Thursday, Yankees third base prospect Miguel Andujar practiced throwing the ball to first base with his eyes closed. He took tosses and groundballs from infield coordinator Carlos Mendoza. After he fielded the ball, he closed his eyes and fired to first base. Luis Cessa will get the start against the Tigers. Cessa is in the mix to be the Yankees’ emergency/sixth starter and figures to start the season at Triple-A — unless, you know, there’s an emergency. But after Cessa, reliever Ben Heller will enter the game. The bullpen is pretty much set — maybe Chasen Shreve’s spot is the only one up in the air, but Heller doesn’t figure to be competing for it. Still, he’s talented. Have you watched his fastball? Go YouTube it (after you read more NJ.com stories). Crazy arm-side run. The Yankees will play their first Grapefruit League game later today and here is a ten-question mailbag to hold you over until first pitch. I’m so happy baseball is back. As always, RABmailbag (at) gmail (dot) com is where you can send all your questions. Aryeh asks: Thoughts on a couple of articles out there comparing JD Martinez to Giancarlo as a hitter and the Red Sox are paying a lot less money? Both guys have an injury history — Martinez has played more than 125 games in a season once in his career — and, of course, baserunning and defense matter. That’s why Stanton has the edge in both fWAR (+12.6 vs. +10.5) and bWAR (+13.7 vs. +10.9) over the last three years. Both ZiPS (+6.5 vs. +3.4) and Steamer (+5.8 vs. +2.4) give him the edge in 2018 as well. Stanton is two years younger and the two players have identical $22M luxury tax hits. They are comparable as hitters. They are not comparable as overall players, especially when you consider the Yankees will get more peak years from Stanton than the Red Sox will get from Martinez. The “well actually, Martinez is just as good as Stanton” takes were inevitable as soon as Martinez signed with Boston, but Giancarlo is younger and clearly the better all-around player. Michael asks: Given the weirdness of this offseason, what do you think Stanton would have gotten if he was a true free agent? Pretty much exactly what is left on his contract, ten years and $295M with an opt-out after the third year. Giancarlo Stanton would have been, by frickin’ far, the top free agent on the market this winter, and the best position player to hit the open market since … Robinson Cano? I guess so. And Stanton is three years younger right now than Cano was when he hit free agency, plus he’s coming off a 59-homer MVP season. Even in this slow market, a just turned 28-year-old Stanton would’ve been in demand this offseason. The Red Sox would’ve been an obvious suitor, and I imagine the Giants would’ve been aggressive as well. Bryce Harper and Manny Machado will get paid next year. Stanton would’ve gotten paid this year. It’s the second and third tier guys who are really getting hammered in this market. The top players still cleaned up. Anonymous asks: If Todd Frazier was the same exact player/hitter, but batted Lefty instead of Righty, would that have made re-signing him more of a priority? Or do the Yanks still pass on him because of the $$$? I don’t think that would’ve changed anything. A left-handed hitting Todd Frazier would’ve helped balance the lineup, no doubt, but it sounds like the Yankees were only interested in a one-year deal, indicating they didn’t want to block Miguel Andujar or get tied to potential decline years with Frazier. Brandon Drury is seven years younger than Frazier, substantially cheaper, and more versatile. He’s more luxury tax plan friendly and roster friendly. Frazier was a good Yankee during his brief time in pinstripes. I am 100% cool with moving on in favor of younger options. Jackie asks: While I know it will never happen given all the analytics these days in baseball – but from my view you can address ‘pace of play’ simpler by putting more ‘play’ back in the game – hit and run, stealing bases, etc. Seems to me if there is more action on the field it would by default make the game more exciting and I’d be happy to sit thru a 4 hour game! You think anyone would be brave enough to try that route? Agreed! I think the single biggest problem with baseball right now is the continued increase in strikeouts. MLB has set a new record strikeout rate every year since 2008. The league average strikeout rate was 21.6% last season. It was 16.4% back in 2005. Huge difference! Given the value of on-base percentage, these days we’re seeing more deep counts and long at-bats than ever before, and with each passing year, more and more of those long at-bats are ending without a ball being put in play. It can get dull, for sure. I see no reason to believe the increase in strikeouts is cyclical and will self-correct at some point. Pitchers are throwing harder than ever before, they have nastier breaking balls, hitters are selling out for power, and they’re working deep counts. All of that is conducive to more and more strikeouts. The league average strikeout is going to keep going up, I suspect. It might be near 25% within 10-15 years. For real. Baseball is trending in that direction. How does MLB fix the strikeout problem? Off the top of my head, the only thing I can think of is lowering the mound. When MLB lowered the mound way back when, the league average strikeout rate went from 15.8% in 1968 to 15.2% in 1969. It kept dropping too. From 1970-85, the league average strikeout rate was 13.4%. Then it started to tick up again. Maybe lowering the mound again isn’t realistic. Something has to be done about the strikeouts though. No one cares about pace-of-play as long as there’s action on the field. Ricky asks: This is not exactly Yankees question, but what is the real advantage of a six man rotation? By definition, a team’s number 6 starter is guaranteed 25 or so starts per 162 game season. How is this a winning formula? It’s all about health. No team makes it through a season with only five starters nowadays. They’re lucky if they make it through a season using only six or seven starters. The idea behind a six-man rotation is keeping everyone healthy, and potentially getting more total starts from your top six starters than you would with a normal five-man schedule. I haven’t seen any evidence showing that a six-man rotation helps keep pitchers healthy, but that doesn’t mean it doesn’t exist. Intuitively, it makes sense. Pitching is inherently risky. You can do everything right and still get hurt. Pitching while fatigued is even more dangerous, so fewer starts with more rest would theoretically reduce injury risk. Yes, your top five starters go from 32 starts a year to 27 starts a year with a six-man rotation, but most aren’t making 32 starts anyway. If a six-man rotation keeps them healthier, then you’re better off in the long run. Frank asks: Given the slow FA landscape, do you think CC’s 10 mil. contract was an overpay? If so, by how much? I don’t think so. And even if it was, it wasn’t an overpay by much. Jaime Garcia got one year and $10M from the Blue Jays. Andrew Cashner and Jason Vargas each got $8M annually, reliever-turned-starter Mike Minor got $9.33M annually, and Tyler Chatwood got $12.75M annually. Every single one of those guys is flawed too. Cashner didn’t strike anyone out last season, Vargas got bombed in the second half, Minor has an ugly injury history and was a reliever last year, and Chatwood has an injury history and got hit around pretty hard last season. One year and $10M for CC Sabathia and his balky knee seems about right to me, especially since there’s no worrying about whether he’ll fit into the clubhouse, if he can pitch in a hitter’s ballpark, and if he can handle the expectations. Joe asks: Can you explain the differences between incentives and escalators? There was a piece how about the Giants got around this. Would this apply to the Yankees and how could they structure a deal with Arrieta or another high priced FA to avoid the $197 luxury tax? Incentives raise this year’s salary, escalators raise next year’s salary. The Giants signed Tony Watson to a three-year deal worth $7M guaranteed — he can opt-out after the second year — which is an absolute steal given some of the bullpen contracts that were handed out earlier in the offseason. Escalators could push the total value of the contract to $14M over two years or $21M over three years. So, for luxury tax purposes, Watson counts as $2.33M this year ($7M across three years). If he hits the escalators, his 2019 and 2020 luxury tax hits will be recalculated. The Giants want to to stay under the luxury tax threshold this year and Watson’s contract structure helps make it possible. The Yankees could try something similar with Jake Arrieta or any other free agent, though push it too far and MLB will step in since it’s obvious luxury tax circumvention. It’s one thing to do it with a reliever who can earn an additional $14M across three years. What would be the structure with Arrieta? Two years and $30M with $20M in escalators for 2019? That’s pushing the envelope a bit. It sure seems like MLB is willing to let teams be creative. I imagine they have their limits though. Frank asks: Thoughts on bringing back the bullpen cart? (Not all relievers can sprint like DRob). With pace of play rules in effect and relief pitchers potentially not getting 8 warmup pitches bc of the new pitch clock, wouldn’t getting them to the mound faster be a solution? Not to mention with commercial time being shortened the cart will allow teams to add advertising to make a few extra dollars too. I saw the report that MLBPA broached the possibility of bringing back bullpen carts and all I could think was “at least the union is focused on the important things.” The bullpen cart might get the pitcher to the mound a little quicker, and that will be important now that there are 20 fewer seconds during commercial breaks, so in that sense I guess bringing them back would be worthwhile. And if it’s a fun novelty that makes people enjoy baseball more, great. Not sure this is a pressing issue though. The MLBPA has bigger fish to fry. Doesn’t seem to be much upside to bringing back bullpen carts aside from selling ad space and squeezing in maybe one more warm-up pitch. Dan asks: In light of the Drury trade, what two prospects get added to the Yanks top-30? I had Nick Solak and Taylor Widener ranked as the 16th and 22nd best prospects in the farm system, respectively, in my annual Top 30 Prospects List. The last two prospects to get cut from the list were Nolan Martinez and Pablo Olivares, though I don’t spend a ton of time ordering guys outside the top 30. Josh Rogers, Rony Garcia, and Glenn Otto were also in that 31-35 range. In fact, a few early iterations of the top 30 included both Martinez and Oliveras (and Rogers and Garcia) before I shifted things around and settled on a final order. Olivares was one of my Not Top 30 Prospects. Martinez missed a chunk of last season with a shoulder problem but has nasty stuff, including a high spin curveball that is one of the best in the system. Hopefully he stays healthy this year. Daniel asks: Do you think that the two people that can’t co-exist on the Yankee roster/bench are Drury and Tyler Austin? Drury hits better, is more versatile in the field and hopefully can do the one thing that Austin is penciled in for: BU1B. It sounds like Drury is going to take Andujar’s roster spot as the starting third baseman. I don’t love it, but whatever. (I’d rather see Andujar at third and Drury at second until Gleyber Torres is ready.) The Yankees figure to have a four-man bench. Two spots will go to Jacoby Ellsbury and Austin Romine. Another goes to a utility infielder, probably Ronald Torreyes. That leaves the final spot open for Austin, who Aaron Boone said is the leading candidate to back up Greg Bird this year. Eventually, when Gleyber is deemed ready, Austin would be the obvious candidate to lose his roster spot. Drury would take over backup first base duties in that case. I could definitely see both Drury and Austin on the Opening Day roster. Once Torres (and/or Andujar) get their shot, there won’t be enough space on the roster for Austin. TAMPA — No one does an imitation of Joe Torre walking from the dugout to the pitcher's mound quite like Aaron Boone. Video of Boone hilariously doing the Torre walk when he was with ESPN's Baseball Tonight has garnered nearly 40,000 views on YouTube — and probably even more laughs. But don't expect Boone to be imitating Torre's walk when he manages his first Yankees spring training game on Friday. "I'm just hoping I don't trip and fall," Boone said jokingly after his Thursday press conference. Whether he can manage remains to be seen, but Boone certainly looks the part. His hat is often eschewed, his shades can sometimes be found on the back of his neck, and he always walks around with a bat or sunflower seeds in his hands — sometimes both. The atmosphere in camp has seemed pretty light and relaxed, though Boone has obviously told his players to embrace championship-or-bust expectations and the pressure that comes with them. Boone figures to learn a thing or two more than more-established managers over the next few weeks, but he's not about to put a ton of importance personally on games that don't count in the standings. "We're just trying to make different evaluations and probably allow or do some certain things that we might not in the regular season," Boone said. "Kind of getting a feel for skillsets and what we think different guys are capable of doing. But as I've said before spring training is really about individual players and getting them ready for Opening Day, and tomorrow is the start of that." Marquee offseason acquisition Giancarlo Stanton is expected to make his spring Yankees debut, highlighting the day. Last season, Aaron Judge hit a mammoth homer in the first game of the spring. No one knew it at the time, but it was a sign of things to come. "There will be a little excitement with the crowd and pinstripes and playing a game and playing another team," Boone said. "The juices start to get flowing for that." Still, Boone says there are things he can pick up, whether that's early evaluations of opposing players or situations that come up in the course of a game. "I don't think there's anything especially in these early games where you're going to pick up anything strategically, but it gives you a chance to see opposing players and start to formulate an opinion and a thought, hopefully things that go into allowing us to win ballgames," he said. The pregame workouts are in the books. "I kind of keep telling people there's nothing that has blindsided me or has been overwhelming or anything like that," Boone said. "There are a lot of things that come across the desk each and every day. There are a lot of things you kind of have your tentacles on or are trying to touch each and every day with your coaches and your players. But nothing that's been overwhelming so far, (though) I understand that day is coming too." Judge (shoulder) just tracked pitches Thursday, rather than taking full batting practice. “He’s doing well, and I think right on schedule to go in a game next week,” Boone said, noting this was built into the schedule. … Boone said Gary Sanchez getting Friday off had nothing to do with last year’s bench-clearing incident against the Tigers, noting the team has a specific plan to keep its franchise catcher fresh. 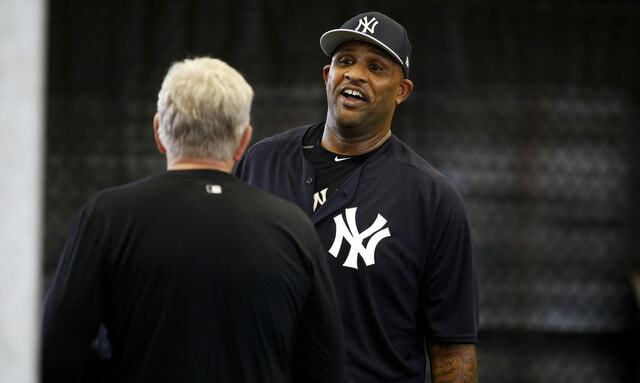 …CC Sabathia threw a live batting practice session. He doesn’t have a date yet for his first spring start, but plans to do bullpens and perhaps sim games in order to stay fresh. Sabathia thought he had a better feel for his changeup. ...The goal is to keep him healthy. Sabathia tweaked his ankle during a fielding drill early in camp, but it wasn’t anything significant. This is the nightly open thread. All five local hockey and basketball teams are playing, plus the Olympics are still going on. Talk about those games, the day in Spring Training, or anything that isn’t religion or politics right here.